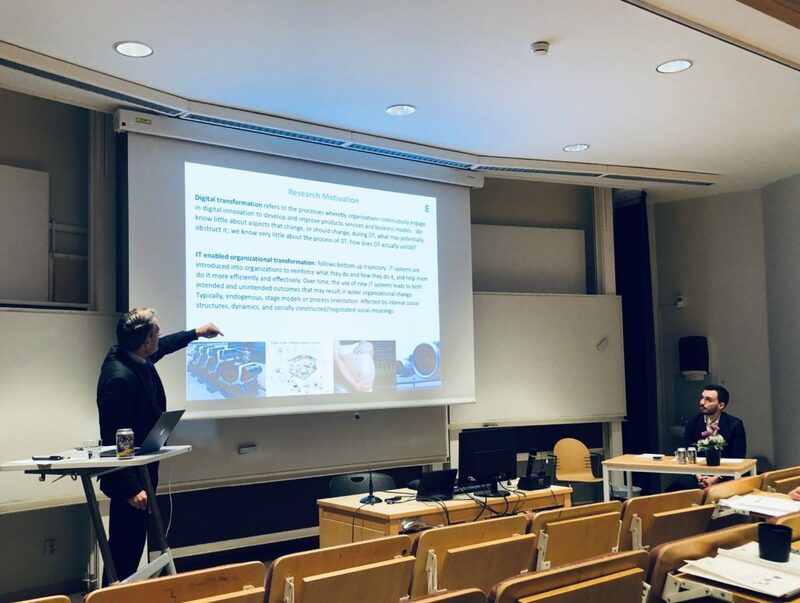 PhD student Daniel Skog today successfully defended his dissertation on the topic of Digital Transformation where professor Jonathan Wareham from ESADE Business & Law Schools at Ramon Llull University served as faculty opponent. The dissertation consists of a collection of four papers along with a cover paper and examines the dynamics of digital transformation, seeking to understand the key sociotechnical elements and their relationships that drive digital transformation processes and influence how they unfold over time. Drawing on the four papers as well as on extant research, Daniel addresses current limitations in existing research on digital transformation by developing a conceptual framework that contributes to research by clarifying a set of theoretical concepts and relationships that are instrumental for addressing digital transformation as a sequential and cumulative process, and the actors, agency and actions that realize digital transformation over time. The dissertation may be downloaded here. Please feel free to contact Daniel Skog regarding further inquiries into his work. New project funded by Länsförsäkringar How should companies relate successfully to digital transformation?